Johnson Controls has been awarded a $40 million energy conservation contract that includes a remote microgrid on the Marshall Islands, designed to boost resiliency and cut diesel use for the U.S. Army. A partnership of Johnson Controls and the U.S. Army Engineering and Support Center, the multi-stage project is underway at the U.S. Army Garrison Kwajalein (USAG-KA) on Meck Island, part of the Kwajalein Atoll in the Ralik Chain. The microgrid consists of an island-wide, 2.4-MW solar photovoltaic (PV) system and a 2 MW/3-MWh lithium-ion battery storage system expected to reduce diesel consumption by 55 percent, said Greg Downes, vice president, Johnson Controls Federal Systems. 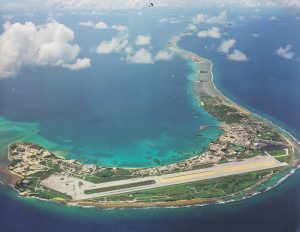 There are many islands in the US Army Garrison Kwajalein Atoll (USAG-KA), and each island has its own generating system. The islands are not part of a larger utility-grade generation system, but rather, each island (including Kwajalen, Roi-Namur, Meck, and others) has its own independent utility, said Downes. On Meck Island, the power comes from diesel generators. Power is distributed to the military facilities through government-owned and operated underground power lines and transformers. The system includes an integrated and distributed microgrid control network. This will control the solar PV, energy storage, and the existing diesel generator assets by deciding which asset is most efficient and reliable at any given point in time. “The new 2.4-MW solar PV system and 2 MW/3-MWh energy storage system was designed to minimize the runtime of the diesel generator assets for operational and energy related benefits,” Downes said. 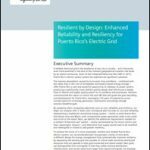 The project began in September 2016 when Johnson Controls received a notice to proceed with the microgrid as part of a broader energy-saving contract. The second and third phases will focus on other islands and may include small wind, solar and storage applications. “We’re trying to understand the challenges of microgrids on remote islands in the middle of the Pacific. There’s logistical complexity,” he said. “We have to employ cyber infrastructure whether it’s associated with the microgrid or other systems. We have to follow a process during construction.” This is a multi-step process, required by the US government, that ensures the infrastructure is secure, Downes said. While cybersecurity protection is inherent in many products and solutions, the Department of Defense has additional operational requirements for such systems. The additional requirements call for consistency in deployment, operation and management of industrial control systems in a networked environment, Downes said. The Department of Defense utilizes a standard methodology for approving industrial control systems called the ‘Risk Management Framework (RMF), he said. When Johnson Controls has successfully completed the required steps in the RMF process, the project will gain an Authority to Operate from the US government, he said. As Johnson controls increases the speed and effectiveness of meeting the government’s cybersecurity requirements, “we believe we can continue to see further custom microgrid applications,” he said. In addition to the microgrid, the project includes LED upgrades that are expected to reduce existing lighting energy costs by 64 percent. Johnson Controls pegs savings from the entire project at $2.2 million annually over a performance period of 20 years. Earlier, Johnson Controls Federal Systems chose Hannah Solar Government Services (HSGS) to design, engineer, and construct the remote microgrid. Track remote microgrid projects worldwide. Subscribe to the Microgrid Knowledge newsletter. It’s free. Will This Solar Community Microgrid Save Money AND Generate Income?